Enchufe fácil de montar para un carril DIN; especialmente útil para conectar un equipo externo. PP - ✔ - These DIN rails, with or without hole pattern, can be cut to the desired length. Toma de corriente para montaje sobre carril DIN. Conexión por terminales de presión para cableado fácil y rápido. 92 mm x 62 mm x 48 mm. 3 terminales de presión para cable rígido o flexilble de 0.5 - 2.5 mm². Fusible integrado de 6.3 A 5x20 mm. Power socket with integrated fuse and pressure clamp connections, available in a range of socket types. Off the shelf enclosure socket, can be installed into enclosures that are located within different countries, socket type depending. The socket can be easily mounted into enclosures as it is mounted onto DIN rails. 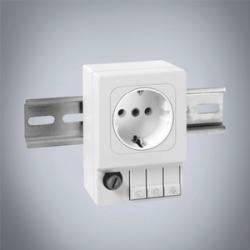 The socket allows the end user to perform both operation and maintenance procedures easily by providing power points if external equipment requires to be plugged in.